Labor Commissioner Brad Avakian last week announced the appointment of Bend's own Yaju Dharmarajah to the Oregon Council on Civil Rights. Dharmarajah is a Sri Lankan immigrant and staff representative with the American Federation of State, County and Municipal Employees (AFSCME) Council 75 in Bend, as well as the co-founder of the Central Oregon Social Justice Center. Though he has spent nearly half his life working with unions, Dharmarajah says he did not always have a favorable impression of labor groups. In fact, his family fled Sri Lanka to escape what he calls "government union thugs" who were attacking ethnic minorities and burned down his family home. But he's always been passionate about human and civil rights and got bit by the union bug as a master's student at the University of Oregon. 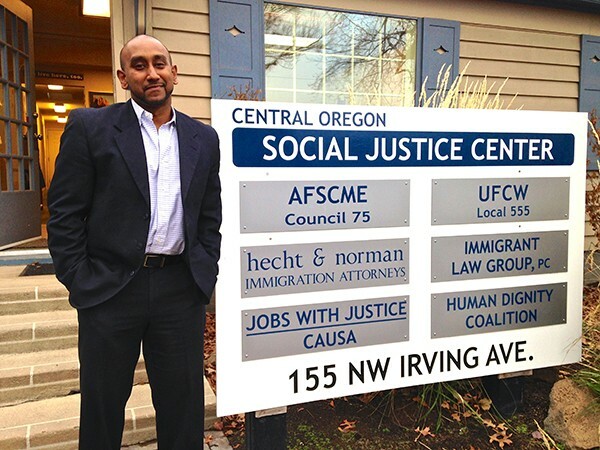 We sat down with Dharmarajah to talk about what it means for the region to be represented on the council, and the most pressing civil rights issues currently facing Central Oregonians. Source Weekly: Tell me about the work you do at the Social Justice Center. Yaju Dharmarajah: It's a collaborative idea of believing that if unions, nonprofits and community groups were all to be housed under one roof we could be more effective in enacting change and enacting a message around issues such as affordable housing, issues such as civil rights, [lesbian, gay, bisexual and transgender] issues, immigration issues and working families issues. We had a major event every other week that came out of this center, everything from a climate change week, to a seminar on race and race relations in Prineville, to a major banquet to trainings. We also housed two interns. We did a big immigration march. So the center is a unique building. This actual building is the only of its kind in the state of Oregon. I think the appointment, to be very frank, is a direct reflection as much on my work as a labor representative, but also on my work with the center and the collaboration we do here. SW: How do you think your work with the social justice center gives you a unique perspective and skill set to bring to the council? YD: I think some people would challenge the skill set question but the perspective is that you sit in on daily meetings with members of the Human Dignity Coalition to get a better understanding of the struggles they face, and Causa [Oregon's Immigrant Rights Organization), with the push for immigration rights for people who are documented and undocumented in this country. It gives you a perspective that issues that affect working families in this country are interconnected to issues that affect us on immigration issues, LGBT issues. My hope is to get there and keep quiet and sit for the first year. But if I could bring anything it would be this understanding of the collaboration of different ideas and issues that affect us, that really form the mosaic of civil rights. Civil rights isn't just a black and white issue, literally or figuratively. Martin Luther King was shot because he was down in Memphis, Tennessee, supporting an AFSCME sanitation workers strike. So the intersections of class, race and working family issues are absolutely what makes civil rights. SW: I understand the council is going to be focusing on income inequality in the coming year. How does your background in labor tie into that? YD: I think Commissioner Avakian—I can only hope I serve him and his office well enough—said they wanted a perspective from a labor angle on the commission. There's a myth out there that public sector employees are over paid and over benefitted. Some of our folks are making just above the minimum wage. A lot of our folks in Central Oregon lost homes in the housing bubble crash. A lot lost incomes during the Great Recession and were down to one income. They are public jobs and the benefits we were able to bargain for them was essentially the difference in keeping them afloat while their husbands and wives recovered, in most cases their husbands. A labor perspective on income equality is warranted because we deal with the merits of income inequality on a daily basis. I think Central Oregon has a unique voice in that we have the highest unemployment in the state. If you look at unemployment officially it's at about 14-15 percent. If you look at the real unemployment in places like Prineville, it's probably about 20 percent, especially with the closing of the mills. I represent the Crook County Roads Department. A lot of my guys came from lumber mills and if they were to lose their jobs now I don't think they'd be able to hang in there. Most of our members are two paychecks away from being insolvent. SW: What would you say are the biggest civil rights issues in Oregon? YD: Central Oregon is fascinating. In terms of racial diversity, there is limited capacity, let's be frank. There is a large migrant and Hispanic and Mexican population, but you're not seeing the diversity you would see in San Francisco or Boston or another urban city. But that doesn't mean you're not seeing racial civil rights issues. However, what I think is one of the bigger issues facing Central Oregonians is affordable housing. I strongly believe access to affordable housing is a civil right, and is related to access to basic rights. I've been pleased with the advent of the courts in trying the right to marry for LGBT couples, but I still think there is a lot of work to do for gays and lesbians in Central Oregon in terms of a greater understanding by the broader public here of their rights and issues, along with the struggles facing transgender men and women—I believe that's an absolute civil right. I also think the right to be treated as a human regardless of your citizenship is a civil right. "Hopelessness is not a strategy for making a difference"